A citizen’s tribunal in Sydney officially described a brutal massacre of indigenous West Papuans in 1998 who were singing, dancing, and shouting freedom slogans. Indonesian security forces shot many, including children, raped women, and tortured survivors. The Indonesian authorities downplay the event, and no one has been held responsible. Indonesian security forces intentionally killed and raped children along with a large number of civilians at a massacre on the West Papuan island of Biak, a tribunal has found. The secret massacre which has been denied for years by Indonesia was officially detailed by a citizen's tribunal which brought down its findings in Sydney recently. It found the Indonesian military butchered dozens of West Papuan civilians who had been protesting for freedom in 1998. They shot children in their school uniforms, raped women, tortured survivors and mutilated victims before two Indonesian navy vessels dumped their bodies out to sea, the tribunal found. The badly broken corpses, some missing legs or heads, appeared in fishermen's nets and washed up on the shore in the days that followed. Nobody has been prosecuted. The Biak Massacre Citizen's Tribunal was conducted at Sydney University in the manner of a coroner's inquest before jurists Keith Suter and John Dowd, with former NSW Director of Public Prosecutions Nicholas Cowdery acting as counsel assisting. 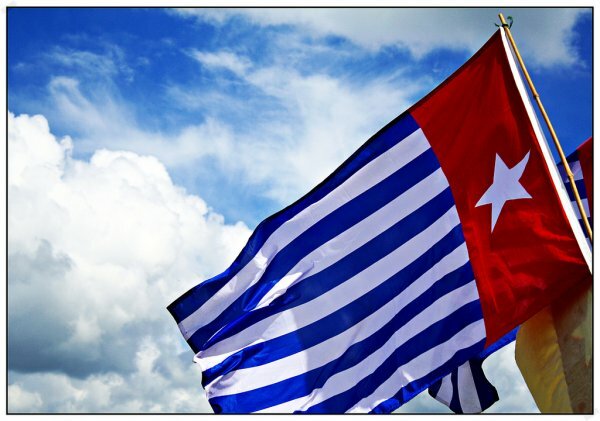 The tribunal heard the events began about 5am on July 2  when Nobel Peace prize nominee and political prisoner Filep Karma raised the West Papuan morning star flag at a water tower. A crowd of about 75 people were singing and dancing, shouting freedom slogans. Indonesian police and military fired tear gas to disperse the crowd that afternoon, to no effect. A police officer then beat an elderly demonstrator and the crowd retaliated by demolishing a truck belonging to the Indonesian security forces. A stand-off ensued for days with the crowd refusing to lower their flag which has been banned since Indonesia annexed the province in 1969. Indonesian security forces surrounded the protesters at dawn on July 6 , gathering in the shape of a giant letter U before firing into the crowd. "Bullets were raining down," said a woman who cannot be identified. "The sky was on fire." Civilians heard the commotion and rushed to the water tower to see the men and women gunned down. Survivors were herded towards the harbour where the Indonesian Navy was waiting for them at the wharf. One survivor named "Sarah" told the tribunal her family followed others with their hands above their heads. "You could feel the bullets starting to fly … I could see so many children who had been killed. They were shot on the wharf." Bodies were loaded on two Indonesian navy vessels, the KRI Teluk Berau and the KRI Kakap, before being dumped at sea. Sarah said she saw a truck take at least 28 bodies away from the wharf. Nobody knows where they were taken. A container truck loaded more bodies later, she said. Another survivor, Tineke Rumakabu, described how she was tossed into a truck and taken to a military compound where she was tortured by Indonesian soldiers. "I saw a little girl and they raped her and she died." Ms Rumakabu said out of 12 women in detention with her, eight were killed and only four survived. The Tribunal found the Indonesian Government has downplayed the seriousness of the incident and no action had been taken against those responsible. It called on Indonesia to hold an independent judicial inquiry into the massacre with criminal proceedings brought against those involved and compensation paid to the survivors and the families of the victims. The Indonesian Government declined to comment. President of International Commission of Jurists Australia John Dowd, one of the Judicial Members to preside over the tribunal said: "No-one who heard any of the evidence would ever forget it." He said particularly disturbing was the sexual mutilation which appears to be a systemic feature of the oppression of West Papua. They intend to present the evidence to the Australian, Indonesian and US governments at a later date.